Villa Histria lies on 16000 sqm of ground and has a great location 15 minutes drive away from Pula with its famous Roman monuments as well as shops and excellent restaurants such as ''Milan'' or ''Valsabbion''. Only1 km walk away from your villa, lies Nesactium with its remains of the ancient fortified town of the Histrii tribe, who inhabited Istria in the Pre-Roman era. Horses on the surrounding pastures will be your only neighbours while staying in this private villa of great quality and style, and the owner will be happy to arrange riding for you. A local shop, two Istrian restaurants and a bar are at walking distance 800 metres away in the village centre. The nearest sea is 3 km away in Budava bay, and a beach with watersports is in Medulin (10km), where you will also find plenty of bars and some good restaurants. About 15 km drive is the beautiful nature park of Cape Kamenjak, and the same distance is Brijuni national park, the paradise-like archipelago near Pula. This villa is of high quality and accommodates 8 people, - 6 in the main house and 2 more in a detached cottage by the house. In the front garden is a 12m x 6m swimming pool tiled with mosaic tiles and roman steps. By the pool is a summer house with covered terrace, barbecue, sink and fridge/freezer and a shower room/wc; next to this is a separate laundry room with washing machine. You enter the main house into a hall with stairs up to the bedrooms and stairs down to the sauna and gym area. 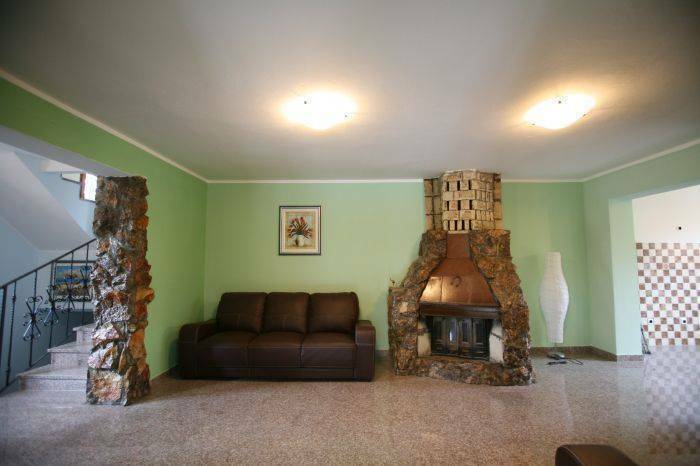 On the ground level are two sitting rooms with comfortable sofas and armchairs; one has with a fireplace, the other one has LCD satellite TV and DVD. 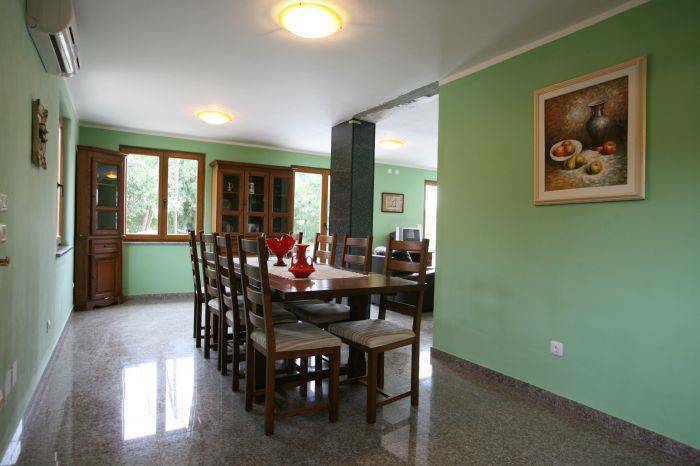 Off the living room is a dining room plus a kitchen, fully equipped with cooker, oven, fridge/freezer and dishwasher. Upstairs is a double bedroom with ensuite shower room/wc and large balcony, a twin bedroom with ensuite shower room/wc plus large balcony, and a master double bedroom with ensuite bathroom/wc (corner jacuzzi bath) and large balcony. All shower and bath rooms have hydromassage system and built in radio, and all bedrooms have their own LCD TV. Downstairs from the entrance hall is a sauna for two , a shower room and air conditioned gym area with running machine, bike plus weights. The cottage alongside the house consists of a little kitchenette with a sink, fridge and 2 hobs, shower room/wc, plus a twin bedroom with LCD TV. Every room in the house and cottage is air conditioned. Downstairs from the entrance hall is a sauna for two , a shower room and air conditioned gym area with running machine, bike plus weights. The cottage alongside the house consists of a little kitchenette with a sink, fridge and 2 hobs, shower room/wc, plus a twin bedroom with LCD TV. Every room in the house and cottage is air conditioned. Villa Histria lies on 16000 sqm of ground and has a great location 15 minutes drive away from Pula with its famous Roman monuments as well as shops and excellent restaurants such as ''Milan'' or ''Valsabbion''. Only1 km walk away from your villa, lies Nesactium with its remains of the ancient fortified town of the Histrii tribe, who inhabited Istria in the Pre-Roman era. Horses on the surrounding pastures will be your only neighbours while staying in this private villa of great quality and style, and the owner will be happy to arrange riding for you. 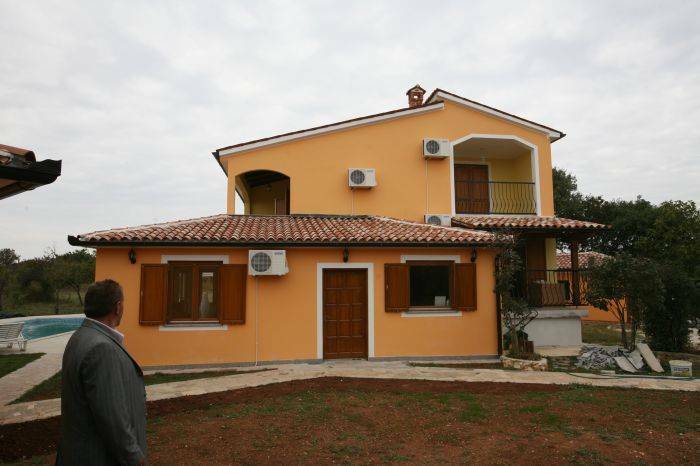 A local shop, two Istrian restaurants and a bar are at walking distance 800 metres away in the village centre. The nearest sea is 3 km away in Budava bay, and a beach with watersports is in Medulin (10km), where you will also find plenty of bars and some good restaurants. Upstairs is a double bedroom with ensuite shower room/wc and large balcony, a twin bedroom with ensuite shower room/wc plus large balcony, and a master double bedroom with ensuite bathroom/wc (corner jacuzzi bath) and large balcony. 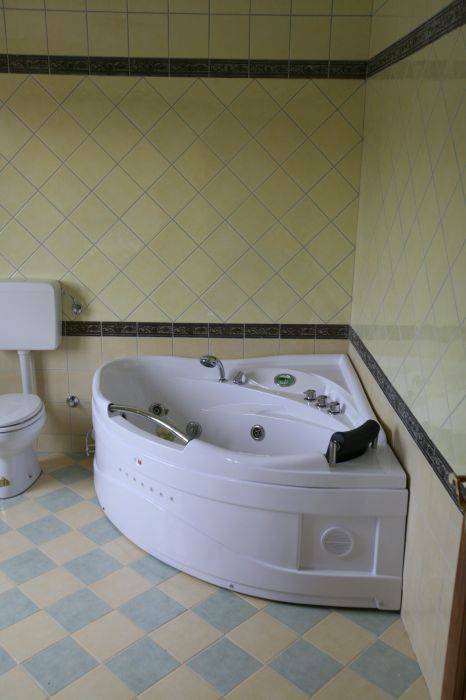 All shower and bath rooms have hydromassage system and built in radio, and all bedrooms have their own LCD TV.